User does not have to do anything special to restore the last settings. .. then you must create readable ASCII-customization files ! OSD will show you where the files will be saved. Now users can experiment to find the best setup for them, and can then "freeze" this state by exporting the customizations to definition files which can then be made available to all users at a site or within a company. !! These files will not be read automatically at startup !! !! 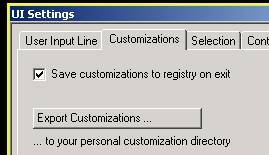 If above registry entry exists, OSD will always read the customization from the registry not from the saved-location ! After this step, start OSD again. OSD will not find any registry entry and will read (if exist) ASCII files from the saved-location. Please keep in mind that Toolbar location information is not stored together with the ASCII-files but only inside registry ! After loading the ASCII-Files the previous toolbar locations are unfortunately lost. You must re-locate them and quit & restart OSD once so the values are again inside registry. What is the command [Reset] / [Reset All] inside Customize-Menu ? [Reset] / [Reset All] resets only contents of toolbars !! After the operation, the number of toolbars stay the same on the screen. A deleted toolbar will not come back again or an added toolbar will not disappear ! If you edit contents of a toolbar (add/delete entries), with [Reset]/[Reset All] you can reset the contents to the last saved-values. How can I take over my customizations from one OSD version to another ? ! ! Don’t make changes to original OSD toolbars and menus but create your own. A new version could have added functionality and you don’t want to overwrite them with your own commands. By creating your own toolbars, you will always have original toolbars of new version correctly. ! ! Split customizations into 2 groups. 3) Delete the files, which are from OSD (they start with “win_”) and keep only the files which are your customizations for all users (company-wide). This means, first files in this directory will be read, later users own customizations. Inside this directory, you can also create a file called "site_startup". Inside you can put commands which will be called at startup time of OSD. To execute commands for Annotation, create a sub-directory “Annotation” and use the Annotation-startup file "am_customize". 5) To create user-specific customizations, we should do the opposite like in step 3. After exporting, delete all which are not user-specific – e.g all original toolbars, menu-definitions etc – leave only user-specific files inside. After installing the new version, export customizations – this will create a new directory. Delete the contents of this directory and copy the user-specific files from the previous version to this directory. Delete registry entry of the new version ( run “regedit” or use “ResetUISettings.bat” ) and restart OSD. Reposition toolbars and exit OSD – this writes again to the registry. · Company-specific customizations are in one location – outside of OSD installation directory. They will only be edited centrally. · Original OSD files are not edited.